I admit it; I am a fan of Neil Gaiman. At the beginning of the month, I reviewed The Ocean at the End of the Lane for my work with SQ Mag. At Neil’s talk for the Vancouver Writer’s Fest, I noticed a number of fans with this book under their arm. It was his last adult novel, before this latest release. So I thought I would give it a go, honestly not knowing what to expect. 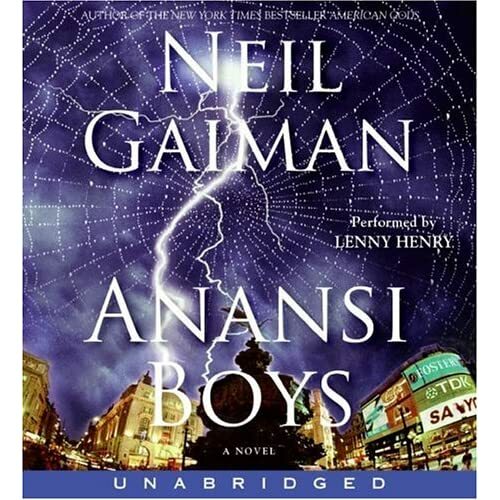 Anansi Boys draws on the storytelling element of oral traditions, particularly of the people of the Carribbean and their roots in the rich mythology of African culture. It follows Fat Charlie, a rather unassuming young man with major problems with his father and a life devoid of any real spark. When his father dies, Fat Charlie returns home and learns a startling fact: he has a brother. A chain of events, kicked off my Fat Charlie’s errant brother Spider, leads to the destruction of the dull life that Fat Charlie holds dear. What follows is a story about coincidences spiralling out of control, aided by a touch of old world magic. It is a story about growing up, about making your way in the world when you’re in the shadow of big characters about you. It’s about family, and especially how you cannot choose them. But there’s also a quest element, which really keeps the story in tone with the oral traditions and links in to cultural manhood ceremonies of older traditions. My favourite parts are the snippets of folklore. I was a big fan of Brer Rabbit stories as a small child, with their skewed morality of tricking the greedy or lazy. These were based in African tales, told often of Anansi in African mythology, well researched by Neil Gaiman I am sure. There are several small stories within the novel and I enjoyed these fable breaks. The perception of the shadowy realms of magic and ancient power of the mystical run strongly through this book, and are described well. It is not the strongest of Neil Gaiman’s novels that I’ve read. Some of the characters weren’t as real to me as some in his other novels, even if they had some endearing traits. For this novel, there’s a lot of interplay of mysticism and the supernatural, and the nicely packaged ending created a few moments that felt a bit forced for me. If a new reader of Neil, I wouldn’t suggest starting with this one, as I would prefer you fell in love with his work. For those with a love of oral traditions, it’s a great book for weaving in tidbits of the stories, and I think you might enjoy the main arch as well. Have you read the book? I’d like to know what you thought of it. Rather enjoyed this one, Id put it above neverwhere and just under American Gods. I’m a huge fan of his use of various mythologies and his presentations of “divine” in the different stories. This book got me seeking out more stories about Anansi and found some really neat cartoon stories that I show my daughter sometimes. There is a nice mix of dark and light in this story as well as that getting in touch with your roots aspect that a lot of us with Native blood can relate to. Before reading, I didn’t know the Brer Rabbit stories were related to Anansi. Pretty cool though. I do like his approach to mythologies and the divine. American Gods has been my favourite though.